New book by author, Cheryl Yolanda Howard encourages people to seek God during their happy times, tough times, and every day times. Maybe readers are not free and liberated enough on the inside to be or socialize and interact with groups, crowds or in unfamiliar environments. So what people are inclined to do is hide inside themselves or in familiar situations or relationships-deemed dysfunctional or miserable, where they feel safe and comfortable. But really, they’re crying out on the inside; afraid, can’t trust, feeling stuck and bound. The author says there is a solution, where the spirit of the Lord is, there is liberty! Cheryl says that He is Lord of a breakthrough and she is here as a witness to encourage everyone to invite His spirit into their spirit so they can have liberation. The wrestling can end, the struggle can cease, the battle within can come to a halt, according to Cheryl, if people will just believe. “Through my testimonials about my personal struggles and issues such as overcoming molestation, fear and insecurity, adjusting to life after divorce to single-parenting, experiencing homelessness/displacement, and from having no HS diploma to earning a BS and two MA degrees starting in my 30's, launching out into the deep to start my own business and completing this book, in the midst of my own crisis and this country’s economic crisis… Through Him, I have uploaded those dreams and visions that were lying dormant as he downloaded blessings and favor upon me and my daughter’s life. Read this book and understand how God fearfully and wonderfully created you for such a time as this,” says Cheryl Y. Howard. 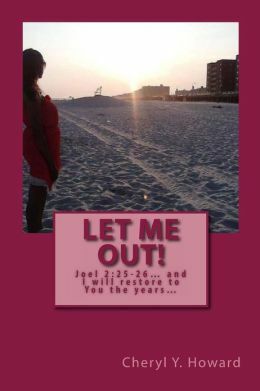 Let Me Out is available in both print and ebook formats. Cheryl Y. Howard has experience in individual and group Spiritual Counseling, Outreach, Case Management, Community Integration Counselor, Positive Behavioral Intervention Support Provider, and Client-Advocacy. She has a M.A. in Human Services: Marriage & Family Counseling from Liberty University Graduate School Center for Counseling and Family Studies. Ms. Howard is also Certified in Pastoral Counseling and has attended Fordham University School of Social Services MSW program, and pursuing a M.A. in Theological Studies from Liberty Baptist Theological Seminary Graduate School(May, 2013). Cheryl is an Associate Pastor and Pastoral Counselor with the J.U.S.T.I.C.E Organization and Jesus is Justice Mission Church in Far Rockaway Queens, NY, Get Your Life Back Ministries.